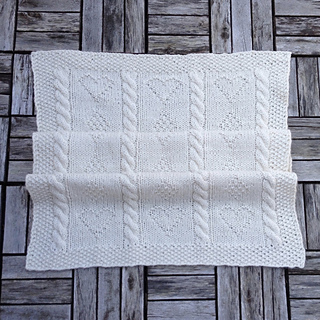 Jurriaan is a baby blanket with hearts, diamonds, and simple cables. Inspired by traditional gansey sweater patterns, it’s worked in a bulky yarn that makes it a quick and warm project. 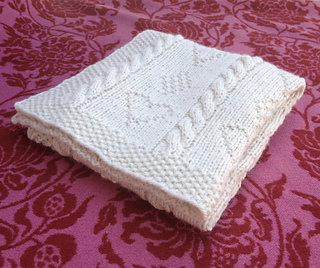 The pattern assumes that you know how to read charts and knit cables. 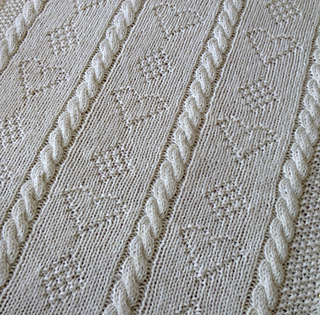 The diamonds and hearts are patterned on RS and WS rows; cables are crossed only on RS rows. Instructions are included for adjusting the size of the blanket. With thanks to my test knitters ViolaC and tangleofyarn67!